Custom Designed Indoor/Outdoor Benches. The one on the left has been loaded into a van. Notice the four happy bears. One of them left their footprints! 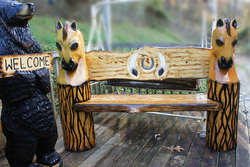 Doug Henne creates benches with bears, horses, eagles and more. And they all start with a tree log and a chainsaw. Each bench is custom made and one of a kind in detail. As Doug says, "I make them for myself, as if I'm going to keep them. It really is hard to sell sometimes something that a part of you is in." To help understand perspective, here is the Horse Indoor/Outdoor Bench on an outside deck. Doug will try to keep one of these in stock due to the demand. If unavailable, Doug is happy to do a custom project for the client. Some prefer a brown or black horse. Once details are fully provided, Doug will start the rough chainsaw cuts. Then he will give the wood drying time in the drying room. Then he can begin the detail carving, paint and coat for indoor/outdoor display. Allow approximately 4 weeks+ for the completed project. Doug says the horses can take a little extra time because he likes to "hand rub sand" for the smoothest finish. "There is a place for tools, but the final most important tool are my hands." 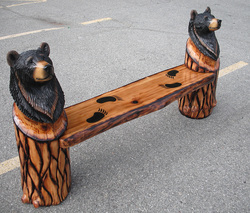 The small absolutely gorgeous carved Bear Bench. There is such a security about this bench. Clients say they "feel like the bears are alive. For a minute you feel like one of them." Each 'sitting platform' of the benches are removable. Doug Henne : Artisan : He can create your custom Bench for your real estate and/or to enhance your collection. Doug may start with a loud chainsaw, but "... the final most important tool are my hands."